Since 1997, a combination of pediatric incentives and requirements has significantly increased pediatric drug research and development and stimulated an increase in pediatric labeling. Since that time, 28 drugs were studied in neonates and there were 24 related labeling changes. In a review of 446 335 hospitalized infants by Laughon and colleagues, 13 (46%) of the 28 drugs studied in neonates were not used in neonatal intensive care units and 8 (29%) were used in fewer than 60 neonates. In their editorial, Stiers and Ward discussed the implications of this for evidence-based care of sick newborns. Papania and colleagues reviewed the evidence for sustained elimination of endemic measles, rubella, and congenital rubella syndrome from the United States through 2011. Since 2001, the US reported measles incidence has remained below 1 case per 1 000 000 population. Since 2004, rubella incidence has been below 1 case per 10 000 000 population, and congenital rubella syndrome incidence has been below 1 case per 5 000 000 births. In a related editorial, Grabowsky discussed the implications for this triumph as a stepping stone to global eradication. For many years, pediatric guidelines have recommended the avoidance of peanuts and tree nuts for at least the first 3 years of life, with some experts also recommending that these be avoided during pregnancy. 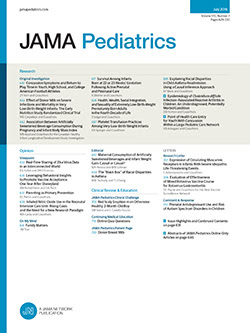 Analyzing data from the Nurses’ Health Study II and the offspring participating in the Growing Up Today Study 2, Frazier and colleagues found that the risk for peanut and tree nut allergy was 70% lower in mothers who consumed more nuts during their pregnancy than those who had nuts less than once per month. In an accompanying editorial, Gupta discussed the implications for childhood food allergy. While metformin is approved by the Food and Drug Administration for treating type 2 diabetes mellitus in adults and children older than 10 years of age, it has been used off label in recent years to treat childhood obesity. In a systematic review of 14 randomized clinical trials, McDonagh and colleagues found a statistically significant, but very modest, reduction in body mass index over the short term among those aged 10 to 16 years when metformin was combined with lifestyle interventions. It was not clear that there was any benefit from longer-term treatment.